Hispanics by a large margin believe that immigrants have to speak English to be a part of American society and even more so that English should be taught to the children of immigrants, according to recent surveys conducted by the Pew Hispanic Center. The endorsement of the English language, both for immigrants and for their children, is strong among all Hispanics regardless of income, party affiliation, fluency in English or how long they have been living in the United States. The Pew Hispanic Center, in collaboration with the Henry J. Kaiser Family Foundation, probed attitudes toward the English language in public opinion surveys conducted in 2003 and 2004. In one of these surveys, Latinos were asked whether they think immigrants have to speak English to say they are a part of American society. In another they were asked whether teaching English to immigrant children is very important, somewhat important, not too important or not important on all. A clear majority of Latinos (57%) believe that immigrants have to speak English to be a part of American society while a significant minority (41%) says that they do not. Latino immigrants are slightly more likely (57%) to say that immigrants have to learn English than native-born Latinos (52%). The view that immigrants have to learn English is held by a majority of Latinos regardless of how much money they make or their level of education, according to the 2004 National Survey of Latinos: Politics and Civic Education. Do immigrants have to speak English to say they are part of American society, or not? There are some differences depending on party affiliation, religion and age, though majorities on this question prevail in all instances. Almost two-thirds (64%) of Latino Republicans believe immigrants have to speak English to say they are part of American society. By comparison, 58% of Latino Independents and 52% of Latino Democrats say immigrants must speak English to say they are part of American society. Two-thirds of Protestants (67%) and those who say they are born again take this view, compared with a little more than half (54%) of Catholics. Older Latinos are more likely to say immigrants must speak English to be a part of American society than younger Latinos. For example, among Hispanics 65 and older 69% held this view compared with 48 % of Hispanics ages 18 to 29. By overwhelming margins, Latinos say it is very important that English be taught to children of immigrant families, according to the Pew Hispanic Center/Kaiser Family Foundation National Survey of Latinos: Education. Hispanics hold stronger views than either non-Hispanic whites or blacks (92%, 87% and 83% respectively). How important is the goal of teaching English to the children of immigrant families? Is it…? This support is equally high regardless of party affiliation, income or language ability. Foreign-born Hispanics are even more fervent that English be taught to immigrant children compared with native-born Hispanics (96% to 88%). As telling, perhaps, is a look at how many people said teaching English to immigrant children is not important. 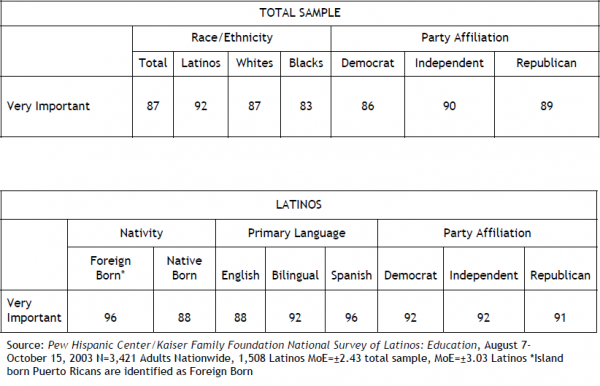 Among Latinos, only 2% held this view compared to 27% of non-Latinos.